It’s our last day of “Women in Youth Ministry Month,” and I want to take today to share something I’ve been working through for the last month or so. Last month I went to the FIERCE Conference, a gathering of mostly United Methodist Female pastors (and some strays, like me. #unordained). The gathering included the most incredible preaching I have ever heard, with words of truth that felt like they were tailored just for me. Alethea talked about how God made us women on purpose. That the inner dialogue of “if only I was a male…” is unfair to our giftings and what we have to bring to the world. That God is FULLY manifested in women, and not partially as we are often conditioned to believe. And that if our strengths intimidate others, it is their weakness, not ours. I will not apologize for being strong. And I won’t tolerate you calling me bossy. I will not apologize for liking things a certain way. You would never scrutinize a man for this. I will not apologize for crying during meetings. Both the happy stuff and the hard stuff. I will not apologize for needing day off for my period. Have you ever seen a man with a cold? I will not feel shame for the way I dress. My shoulders and my shoe collection are not your topics of discussion. I will not feel shame for the babies I do/do not have. I am so much more than my uterus. I will not be afraid of asking for what I need and/or deserve. 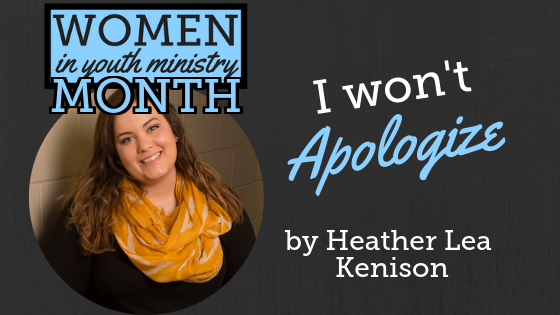 I won’t apologize for being a woman, and not a man, in ministry.